Paint your nails with 2 coats of a dark blue polish (we used Dance in the Dark) and allow to dry. This will be the base of your cosmic design. Carefully pour a small amount of a brighter color (we used Mermaid's Tale) onto the plastic sandwich bag, then use your eyeshadow applicator to pick up some color to apply to your nail. Gently dab the applicator on your nails - don't worry about being messy! Repeat steps 2 and 3 with other spacey colors (we used Kickin' It, 9 to 5 and Metallic Heels) to add more dimension to your cosmic design. For extra spacey sparkle, add a glittery topcoat (we used My Private Place) over the entire nail. Don't forget to clean up any extra polish around your cuticles, and follow up with a top coat for shine! Glitter nail polish is eye catching, both on its own and as an accent to a fabulous manicure. But glitter polishes can also be difficult to remove. Here’s a stress-free method for removing glitter polishes from your nails. Take a cotton ball and soak it in nail polish remover – don’t be afraid to use too much! Place the cotton ball on top of your nail, making sure the entire glittered surface is completely covered. 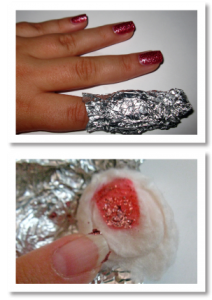 Take one strip of aluminum foil and wrap it around your finger and the cotton ball. Wrap as tightly as you can, so that there is some pressure on the cotton ball – this helps make sure that it stays in contact with your nail. Crimp the foil edges at your fingertip, sealing the cotton ball in. This makes sure that no air can get in and dry out the cotton ball, so that your nail polish remover has more time to work its magic. Repeat process for the rest of your fingers on ONE hand. It’s easier to do this one hand at a time. Once all five fingers are wrapped, wait at least 5 full minutes for the polish remover to thoroughly soak through the glitter polish on your nails. It’s time to remove the foil tips (and the polish)! 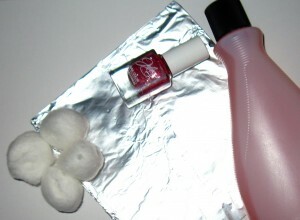 Using a slight twisting/back and forth motion, take the foil/cotton combination off your finger, making sure to concentrate on putting pressure on the nail where the glitter polish is. The glitter is gone! You’re left with clean, scratch-free nails.